The kitchen breakfast room leads off the dining area and features a breakfast bar with 4 stools, space for informal eating with sea views! 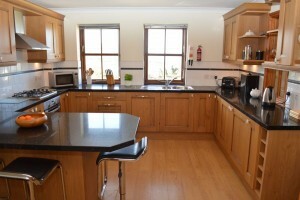 This light and airy room is fitted with a range of oak units and granite worktops. The integrated kitchen appliances include a 4-burner gas hob, single electric oven, dishwasher and under-worktop fridge and freezer. A microwave oven, toaster and kettle are also provided. There are plenty of storage cupboards, well stocked with china, cutlery, cookware and utensils. A good-sized utility room leads off the kitchen and is fitted with units and worktop to match the kitchen. 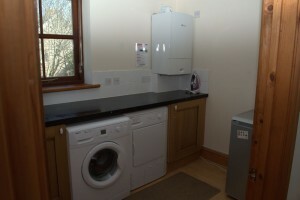 The utility room is equipped with washing machine, tumble drier and an additional larder fridge, as well as the gas boiler for central heating and hot water. 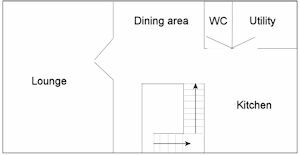 There is also a separate WC on the first floor.